The Earth system / Nature / the biosphere all refer to the same thing: all living things on our planet and the natural environment that makes life possible. The ecosystems of the world revolve around the relationships of living organisms, with each other and with the natural world. Our current global environmental challenges are many, but are all interconnected. Solving one crisis only has meaning if we also effectively address other key elements of the Earth system. The "balance of Nature" is a dynamic balance, with an evolutionary trajectory, composed of quasi-equilibria and degrees of homeostasis that maintain the biotic and abiotic conditions that support the persistence of living species and their ecosystems. Nature has amazing elasticity, but if certain boundaries or tipping points are crossed, extinctions ensue. climate stability – providing conditions that match physiological and behavioral adaptations. Making the conceptual and visual connection between these three elements of the Earth system and transforming this vision into effective action is the raison d'être of this project. Biodiversity, natural habitat and climate stability – three vital components of the same Earth system. For billions of years, the surface of the Earth was covered with an ocean of Nature, which very recently developed islands of humanity. In the last few centuries a phase change has occurred as our human islands have grown to become the ocean, while Nature has been fragmented into biodiversity ecoislands. Habitat loss is the number one current threat to Life on Earth. All macroorganisms on the planet have measurable levels of industrial and agricultural toxins in their tissues, resulting in elevated levels of physiological stress. The species in the ecological food chains act as bioaccumulators, while pollutants circulate around the globe. Human activities also release atmospheric greenhouse gases, the continuing buildup of which is driving anthropogenic climate change. The synergies that arise from habitat loss, ambient environmental toxicity, and unnatural rates of climate change, are driving the Sixth Extinction, resulting in the degradation of our planet’s rich biodiversity. The Fifth Extinction followed the asteroid impact that killed off the dinosaurs. This time, we are the asteroid. But we have intelligence, empathy, and a choice . . . The biodiversity of our planet Earth is what gives all the rest meaning. The physical conditions of a lifeless planet are irrelevant. Without our conscious appreciation of our environment, for all intents and purposes, it doesn't exist. Obviously, we are not the only species that lives on Earth, although we often treat all the other species as if they have no intrinsic value other than in terms of providing human beings commodities or enjoyment. Humanity can not expand to become the only surving animal on Earth; the ecosystems upon which we depend don't work that way. At the heart of a new ethos of sustainability must be biophilia – a heartfelt appreciation of the intrinsic value of other living species, and the right of other animal and plant species to share the surface of the Earth with us. We must act upon this growing ethos by conserving and restoring the endangered speces of plants and animals that make up the biosphere. Biodiversity can not be conserved and restored without simultaneously preserving and restoring natural habitat, the ecosystems within which plants and animals live. Climate change is only important due to the presence of life on Earth. Addressing climate change without effective attention to natural habitat and biodiversity will be almost as disastrous as doing nothing. We can design our urban and agricultural areas to function more harmoniously with the Earth’s ecosystems and restore some of the lost habitat and landscape connectivity. When the Earth's surface is covered by any less than about 70% wilderness, the ecosystems of the world begin to lose their geographic connectivity, plants and animals lose their migrational resiliency, their ability to migrate across the surface of the Earth in response to any number of ecoogical imperatives. A mostly unintended consequence of seven billion humans living on the planet, our conversion of forests, grasslands, and other ecosystems into human-dominated landscapes is ongoing and driving species to extinction daily. Human activities transform the landscape and spew pollutants upon it. Direct effects on the Earth’s ecosystems are causing precipitous losses of biodiversity and natural habitat. 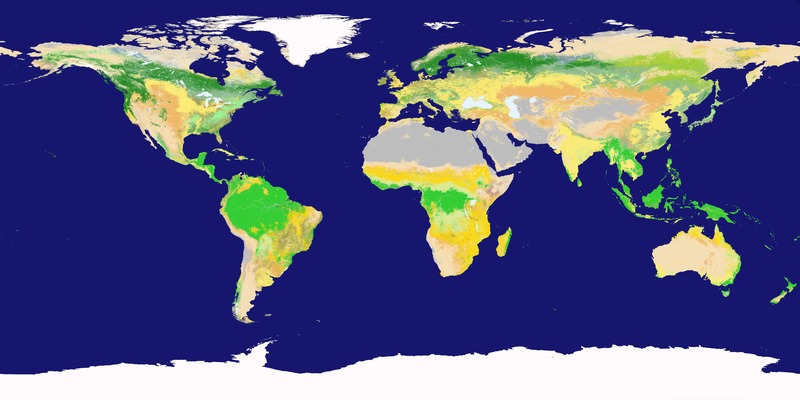 Ecosystem functioning, wildlife migrations, biogeochemical cycles – all of the essential features of our living planet are completely dependent upon landscape connectivity, the geographic continuity of the natural world. One of our primary and accelerating impacts on the sustainability of the Earth's other living species is our conversion of natural habitat into human-dominated landscapes. We have already passed a tipping point in this consversion, a trend that must be reversed in the next few decades. We must preserve and restore natural habitat and landscape connectivity at all scales as a central landmark of our journey to a sustainable world. The third corner of our ecological triangle that we must immediately address is mitigating anthropogenic climate change. The current and projected rates of climate change will outpace the abilities of plants and animals to adjust, through migration and the evolution of new ecological relationships. Pollution creates ambient toxicity and unnatural rates of climate change. Holistic thinking, design, and action are required to effectively address these interrelated challenges. There is no genuine scientific debate over whether human activities are affecting the Earth's climate. The scientific questions are over the degree of our impact and the nature of how feedbacks within the Earth system either amplify of dampen the climate forcing. We know from the Mauna Loa and other CO2 data sources the rate at which carbon dioxide is building up in the troposphere. We also know from over a century of laboratory experiments the effect of CO2 on the thermal emissions radiated into space by the Earth to balance incoming sunlight energy. Basically, so-called greenhouse gases absorb infrared light and then re-radiate the energy isotropically (in all directions) thus returning some of the energy to the surface of the Earth. The Earth must warm to re-achieve thermal equilibrium with the incoming solar energy. These are all well-understood facts. However, the Earth system is complex and full of surprises. Accelerating Earth system research is an imperative. We must re-stabilize the Earth's climate in order to support our progress on restoring biodiversity and natural habitat. All three challenges must be effectively turned around in the next few decades.